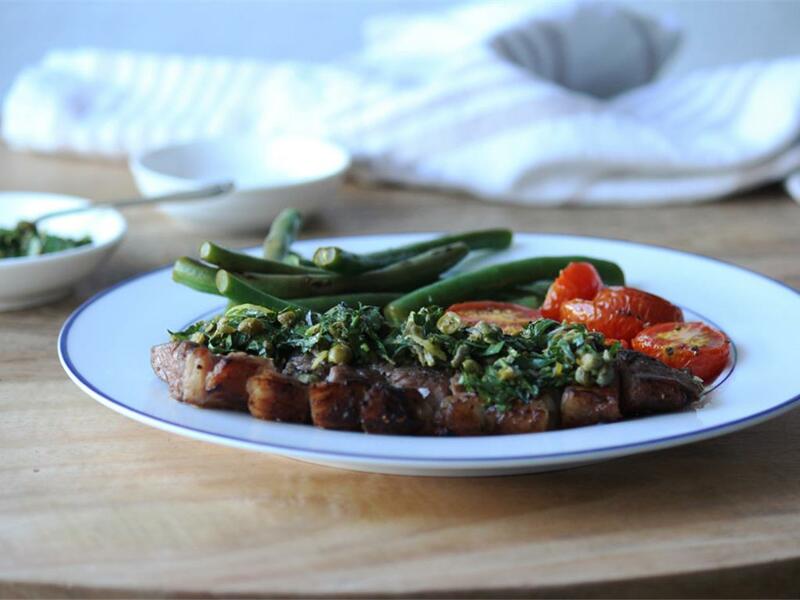 Rump topped with a zest & mint salsa verde, with green beans & roasted cherry tomatoes. Lemon: Using the fine side of a box grater, grate the peel to create zest. Cut in half and juice. Cherry tomatoes: Place on a tin foil lined baking tray, drizzle with olive oil and season with salt and pepper. Mix and arrange skin-side down in a single layer. Roast for 15-20 minutes, until softened and lightly browned. Salsa verde: Chop the mint leaves finely. Mix together the capers, lemon zest, chopped mint, parsley and lemon juice (2 tbsp for 4; 1 tbsp for 2). Then whisk in the olive oil (4 tbsp for 4; 2 tbsp for 2). Rump steaks: Place a dry pan on high heat. Rub both sides of each steak with olive oil and add them to the pan when hot. Sear for 1-1½ minutes a side, only turning them once, for a medium-rare steak. If you would like to rest the steak, cover in tin foil and rest for up to 5 minutes. Green beans: Using the same pan, add the green beans with a splash of water, salt and pepper and blanch for 3-4 minutes until bright green and cooked, but with a slight bite. Serve the rump steak topped with the salsa verde and serve the green beans and roasted cherry tomatoes on the side. "Really enjoyed the salsa verde and the roasted tomatoes worked really well as a sweet relief"